On Saturday 16th July Jan Lee and Tim Murray-Browne were invited to take part in our monthly Digital Design Drop-In programme. 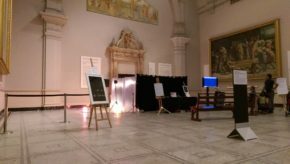 We were delighted that they were able to share with the public their new work combining interactive technology with personal one-on-one participatory work. What is Movement Alphabet? by Jan Lee and Tim Murray-Browne Movement Alphabet is an interactive installation mapping the way we move our body in day-to-day life. 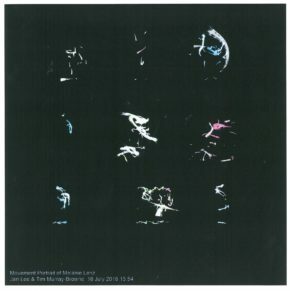 Combining algorithmically generated imagery with a participatory performance, museum visitors are invited to have a portrait of their moving body created in a ten minute one-on-one session. The portrait is created by a digital imaging system that tracks and graphs an individual’s movement over time. Through this system, we are constructing a visual language that captures the essence of how a person moves. Each image is a score of how the person moved during the session, a record of the body alive and moving with a lifetime of experience entwined into each gesture. We want this movement map to pull you in like a manuscript of ancient hieroglyphic texts might – a language you do not know but somehow can still feel for intuitively. Setting up the equipment and material in preparation for the performance. 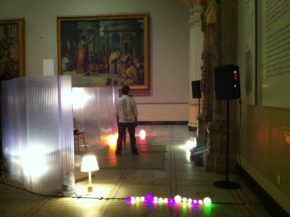 The setting Movement Alphabet took place in the Raphael Gallery which, with its wide open space and subdue lighting, helped to create a contemplative and serene atmosphere for the participatory performance. I was led on a journey through time, space and memory. Initially blindfolded, I became acutely aware of the cool floor tiles beneath my toes and the gentle sounds of the accompanying ambient music. 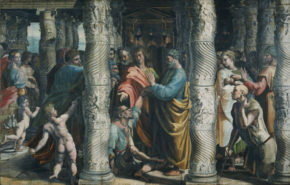 Unexpectedly the experience, which encouraged me to recollect memories and express different body movements, also made me more conscious of the gestural movements and physicality depicted in the surrounding Raphael cartoons. The experience The audience watched as the participants body movements were transformed on the screen into algorithmically generated portraits. Visitors were also given print outs. Here’s what mine looked like! About the artists Jan Lee is a performer and maker working at the intersection of dance, music and physical theatre, often working for immersive or interactive audience participatory productions. Her work has been shown at venues including Live Performers Meeting (Rome), The Place Theatre (London) and The Curve (Leicester). Tim Murray-Browne is an artist working with code and interactive technology. His work includes interactive installations of bespoke musical instruments and sound sculptures revealed as the listener moves through space. It has been shown at venues including The Barbican (London) and Berkeley Art Museum (CA). In 2014, he was awarded the Sonic Arts Prize for his work The Cave of Sounds (2013) created as artist in residence with The Music Hackspace (London). Jan Lee and Tim Murray-Browne have been collaborating since 2011. In 2014 they created the dance work This Floating World intertwining choreography with digital interactive art. In 2015, they were invited to Rio de Janeiro to research interactive sound spaces with immersive theatre company ZU-UK. This year, they are in residence at G.A.S. 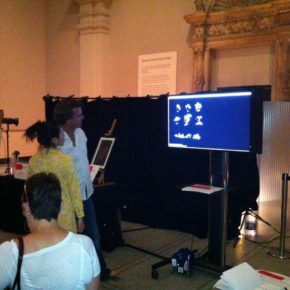 Station (London) to develop Movement Alphabet. The Digital Design Drop-in is a monthly, show & tell programme inviting artists, designers, makers, technologists and other professionals to share and discuss their work with the public.